Group Discussion Ideas > Social GD Topics > Should Jallikattu remain banned? Bulls are subjected to pain and suffering. In order to infuriate them, they are beaten, and are made to pass through a narrow passage. In the process of taming, both bulls and players suffer injuries. Few deaths also occurred in this bull taming sport. There were many cases reported that Jallikattu bulls were forced to drink alcohol, weren’t given food & water, were beaten with sickles just before the event in the process of infuriating them. Just because it is centuries old tradition, it cannot be stated as a right sport. There were wrong practices like sati, untouchability etc in our culture. As we are civilized, we should recognize the wrong things involved in our tradition and we must take steps to create the equal and more humane society. Many political leaders are supporting the sport in the process of vote bank politics. Some political leaders are favoring this sport and are stating that it’s a mere entertainment. We have no right torture animals for our entertainment. It’s a part of Tamil culture and has a centuries old history. Unlike in the past, bulls use in the farm lands has decreased. But because of Jallikattu, farmers are raising native breed bulls. Without this sport, this breed may extinct. There are rules in Jallikattu community to not harm the bulls. But some people are breaking the rules. Ban cannot be imposed just because of some rule breakers. Because of the ban, many bulls were sent to slaughter houses with the lack of money to maintain them. While conducting Jallikattu, medical teams check the bulls before allowing them to participate in the sport. Jallikattu is a bull taming sport of Tamil Nadu, practiced alongside Pongal celebrations. A money pouch is tied to the horns of the bull and is made to pass through a narrow passage in order to be infuriated. The one, who could tame it can claim the money. In 2009, Tamil Nadu enacted a legislation to regulate Jallikattu. In 2011, Environment ministry officially prohobited the use of bulls as performing animals. 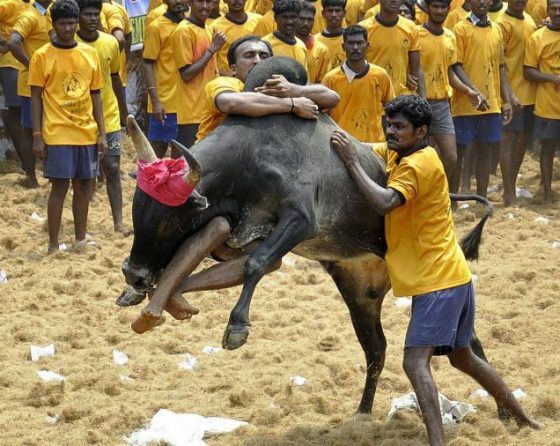 In May 2014, Supreme court banned Jallikattu and other similar kinds of entertainment under Prevention of Cruelty to Animals (PCA) Act, and stated that animals too have right against torture. On Jan 8th, 2016, Environment ministry issued a notification exempting the Jallikattu of TN and Bullock cart race of Maharastra from the law. On Jan 14th, 2016, Supreme court upheld the ban on these events stating that cruelty should not be permitted in the name of culture. It also stated that if culture is at variance with law, law will take precedence. Animals definitely has the right to be treated in a humane way. The ban on Jallikattu is a right step by Supreme court. Now the challenge before the Government is showing alternative source of income to those, who raises bulls. And even more biggest challenge is to stop the cruelty on animals in the slaughter houses. 1.Regarding JALLIKATTUit should be continued as it is the cultural event.And in another way it is helping farmers to keep that breed with them rather than sending to slughter houses. 2.Another important point those animal lovers who are expecting to ban it so tell you feel bad about beating of animals but you don’t feel bad about cutting of animals ESPESCIALLY BULLS. 3.Remember such sports are celebrated in once in year and for that farmers are waiting taking care of bulls like thileir own child BUT WHAT ABOUT EVERYDAY CUTTING OF ANIMALS IN SLAUGHTERS HOUSE AT THAT TIME WHERE IS YOUR LOVE FOR ANIMALS.